This is a great game for groups of children and works with mixed ages well. You will need at least 4 children and up to 8 (any more than that and you should split them into two groups). The object of the game is to be the first to win 3 counters. The children sit in a circle around a table or on the floor. Split the dice so that the oldest child has one and the child sitting opposite has the other. Put the counters in the middle. Repeat the chant over as play continues. Play can get quite hectic! 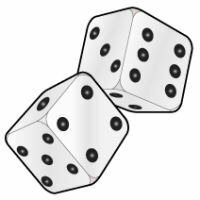 At the Roll now! command, the children with the dice roll - hoping for anything but a 6! If it is 6, they must pass the die to the player on their left and take up the chant. A child wins the round when he is still in possession of a die and is passed another from the child on his right. The winner of the round collects a counter. The first to collect 3 counters wins. Increase the speed of the chant for older children. Real professionals can begin to drop the extra / slap clap / in the game chant for a very fast game indeed! If there are 6 or 8 children playing, you may wish to increase the passing roll to two numbers - say a 5 and a 6. This speeds the game up quite considerably.